Since Mr. Show closed up shop, Bob and David have kept busy with many projects--acting in fun, successful, movies and TV shows, directing things, and complaining about stuff that didn't turn out well to anyone who would listen, and even alone, in silence, inside their own heads. 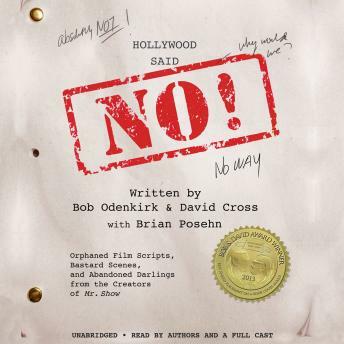 HOLLYWOOD SAID NO! reveals the full-length, never-before-seen scripts for Bob and David Make a Movie (fleshed out with brand-new storyboards by acclaimed artist Mike Mitchell) and Hooray For America! : a satirical power-house indictment of all that you hold dear. This tome also includes a bonus section of orphaned sketch ideas from the Mr. Show days and beyond, suitable for performance by church groups that aren't all koo-koo about religion. What you are looking at online, and are about to buy, is chock-full of comic twists, turns, and maybe a few hard truths. We said "maybe," but what we mean was "probably not." Now, for the first time, take a peek at the scripts that didn't get the go-ahead and ponder a world we can only dream about...and beyond!